EDMOND FOOK was born in Chittlehampton, five miles west of South Molton, in the year that the Commonwealth, instituted by Oliver Cromwell, ended and the monarchy was restored under Charles II. Edmond was the younger son of Amias and probably Martha Fooke. His son became a farmer, so it is possible Edmond was too. ELIANER STEBINS was said to be of Chittlehampton when she married, but her baptism has not been found there. It is just possible that she was some years older than Edmond, and had been born in Chittlehampton before the continuous registers start in the early 1650s, but a birthdate like his, around 1660, is more likely. No evidence of the Stebins surname has been found in the Chittlehampton registers, nor in West Buckland, where Elianer married. But there were a number of Striblings in Chittlehampton. He was miserably harassed, and forced to hide under the roof of his house. When apprehended he was ill-treated to make him disclose the whereabouts of his money. Once when surprised at the parsonage house, Christopher Stebbing, a trooper, one of his parishioners, dragged him downstairs by the hair of his head, he being then 80 years of age. Nevertheless he lived to repossess his benefice at the Restoration. The trooper Christopher Stebbing was of the same generation as Elianer’s father. They were very likely related, though we do not know how closely. Anti-Royalist feeling ran particularly high in the Chittlehampton area. Edmond and Elianer were married in 1687. This could mean that Edmond was then a resident of West Buckland and Elianer belonged to Chittlehampton, or possibly that both were from Chittlehampton. Marriages usually took place in the bride’s parish. Elianer may have been working in West Buckland but had not had her right of settlement transferred there. Or, as sometimes happened, the entry may be incorrect, with Edmond, not Elianer, coming from Chittlehampton, where he was born. Chittlehampton and West Buckland are five miles apart. Their parish boundaries do not quite touch, but come very close. 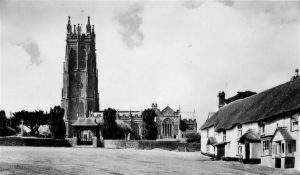 If Edmond was living, and possibly farming, in the north of Chittlehampton parish, he may well have been closer to West Buckland church than to his own. Only one child has so far been found for this couple. He was baptised in Chittlehampton and named after his grandfather. St Hieritha, the Latinised form of St Urith, was a local Christian martyr from Saxon times. Her church was a favourite pilgrimage site until the Reformation. Elianer survived into old age. The reason for their small family may have been the death of Edmond, but no burial has been found for him. We pick up the trail again in the neighbouring parish of Filleigh. The surviving Filleigh registers only date from 1685. They show just one Fook in the 17th century. On 1 June 1694, Edward Fook was buried there. It is sometimes difficult to distinguish between ‘Edward’ and ‘Edmond’ in handwritten registers, so it tempting to make a connection. But in this case the distinction is clear, so, unless his name was wrongly recorded, we don’t know whether the whole family moved here, or when. The clear evidence we have in Filleigh is the burial of Elianer, or Elenor, in 1727, followed by the marriage in 1728 of their son Amos. At the age of 40, he was then a farmer. 1727 Elenor Fook of this Parish was buried 9br 23d 1727 according to Law in woollen only as was testified upon oath 9br 27th by Martha Bill before David Caunieres Rectr of East Buckland, and the Affidavit brought in season to me. Daniel Caunieres Rectr. If Elenor was of a similar age to her husband, she would have been about 67 when she died. The burial record does not say what her marital status was. The fact that Amos married late, less than a year after her death, suggests that she was a widow, and that Amos could not afford to marry and start a family while he was still supporting her.